The Winstep Nexus Dock is a FREE professional dock for Windows. With Nexus, your most frequently used applications are only a mouse click away - and Nexus turns working with your computer into a fun and exciting experience. By using it you can easily place your most frequently used applications, shortcuts and directories on a dock that is easily accessible, but that is just the start. You can also use integrated plugins to route important information from the web into your dock most notably weather information from any destination in the word. 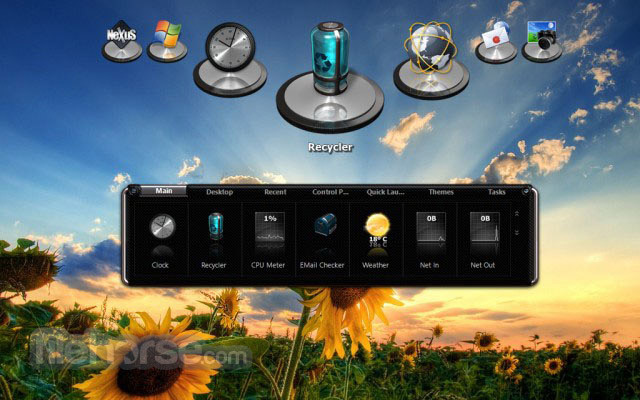 By having this app installed on your PC, users can choose whether or not they want to completely remove classic Windows taskbar and change it with this stylish dock, or to place dock on some other part of the desktop and use both at the same time. It is important to note that Winstep Nexus Dock fully support multi-monitor configurations. Configuration of Winstep Nexus Dock is streamlined to a level that even the complete PC novices can easily master it, and on mere minutes create their own personalized desktop experience that will increase their productivity and bring a little fun to their work. Because docks can hold more than just shortcuts to applications and directories, users are encouraged to create more of them, some for apps, some for widgets that are monitoring your system, and over the last few years, designers from all around the world managed to create strikingly beautiful icon and widget designs that can really make your Windows Desktop pop and look very unique. Easily change appearence of icons of running programs and shortcuts by drag & dropping PNG, ICO and TIF files directly into the icon.